On USC Dornsife Week: Who are the first responders for damaged cells in your body? Irene Chiolo, assistant professor of biological sciences, looks into the body to find out. Irene Chiolo is an Assistant Professor of Biological Sciences with the USC Dornsife College of Letters, Arts and Sciences. She and her team investigate heterochromatin, the ‘dark matter of the genome’, using Drosophila (fruit flies) and mouse cell cultures as model systems. Heterochromatin was little explored for years because it did not appear to encode much genetic information. However, it is a large component of DNA, with mostly repeated sequences requiring a specialized and complex repair process, where mistakes have severe consequences stemming from improper chromosome rearrangements. Even given the high risk and high stakes of heterochromatin DNA repair, these processes remain largely understudied. Research in Dr. Chiolo’s laboratory led to several landmark discoveries, including the identification of the nuclear periphery as a specialized site for heterochromatin repair (Ryu et al, Nature Cell Biology, 2015), and the identification of nuclear actin filaments and myosins as molecular motors propelling this movement (Caridi, D’agostino, et al., Nature, 2018). Failures in these pathways result is aberrant recombination and chromosome rearrangements. This research will ultimately contribute to our understanding of human diseases associated with genome instability, including cancer, aging, developmental defects and neurological disorders. Chiolo received her PhD at the University of Milan, where she studied the mechanisms of DNA repair in the laboratory of Dr. Marco Foiani. During her postdoc in Gary Karpen’s lab (Lawrence Berkeley National Lab/ UC Berkeley, California) she revealed unique mechanisms of repair of repeated DNA sequences. 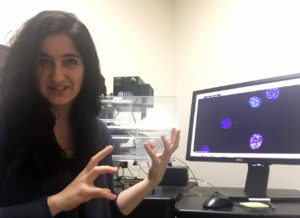 She established her research lab at the University of Southern California in 2013, where she has been appointed Gabilan Assistant Professor of Biological Sciences. Her work is internationally recognized, and she has been awarded several recognitions for her achievements, including: the Edward Mallinckrodt Jr. Foundation Award in 2015, The National Science Foundation (NSF) Career Award in 2018, a Merit Award from Lawrence Berkeley National Laboratory and a Graduate Mentoring Award from the University of Southern California in 2018. Her laboratory is currently funded by the National Institute of Health (NIH), NSF, the Edward Mallinckrodt Jr. Foundation, and the University of Southern California, and was previously supported by the Rose Hills Foundation Innovation Grant and NIH funds. A few years ago my colleagues and I learned that biological cells have their own “emergency room,” at the edge of the nucleus, where damaged DNA is repaired. Now we’ve learned that cells also have a special paramedic team that takes broken DNA to the E.R. You can think of them as the world’s tiniest first-responders. By observing the cellular response in fruit fly and mouse cells, we could see that a series of filaments came together in the cell nucleus to form a temporary highway to the E.R. Then we saw paramedics — a type of walking proteins — pick up the injured DNA and carry it along that highway to the emergency room. We believe this response is a defense mechanism triggered by damaged DNA. Unfortunately, those first-responders don’t always provide the best treatment, and when they don’t successfully repair the DNA, they may be contributing to the development of cancer and other diseases. Improving our understanding of these processes could lead to lifesaving discoveries that prevent and treat diseases.